This book measures 6 7/8" x 4 1/2" and the body of text is printed in Old Style Antiqua. There were at least 420 copies printed on Dickinson Dekel-edge paper and bound in paper over boards with a white buckram spine. Twenty-five copies were printed on Tokyo Vellum and decorated with watercolors by Bertha Hubbard. There are at least five to six variants of this book. 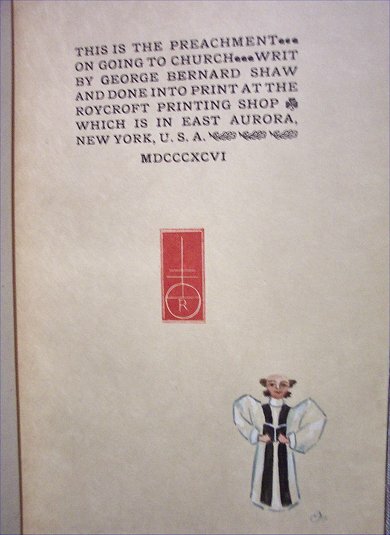 Note: One of the first illustrators at The Roycroft, she was equally adept at landscape, still life and caricature. Almost certainly influenced by Denslow, some books were co-illustrated by the pair.